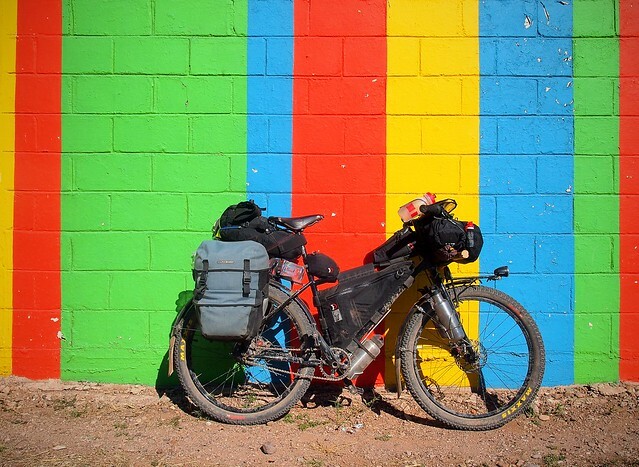 The ultimate expedition touring bike?……. Close. If Surly made the Troll a true 26+ for me, it would be close to the perfect bike, but as it is, well, that’s up to you. As technology and my travel style have evolved over the years, I’ve gone through a few touring bikes; a Surly Long Haul Trucker with V-brakes, a G1 Salsa Fargo, a Long Haul Trucker Disk (still my favorite 4 pannier, smoother terrain loaded touring bike), and now this Surly Troll. 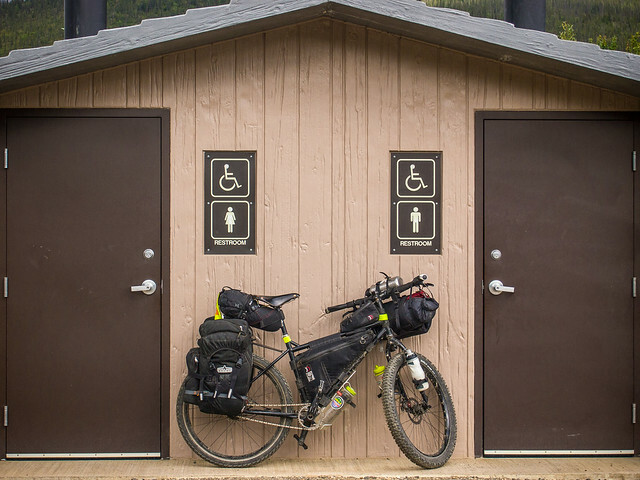 Each one has their strengths, but for the off road touring I seek out, the Troll takes it with the Rohloff compatible rear dropouts, a mountain bike height bottom bracket, and clearance for fat tires. I’m a huge fan of the 29 and the 29+ bikes, but for my size (5’8″) the space between the rear tire and the seat is too narrow to fit a large saddle bag and I also prefer the wide range of 26″ tire choices for touring. In trying out different kits to shed weight and volume, the Trolls latest incarnation has the the rear rack and panniers ditched and replaced with my Carradice Camper Longflap supported by a Carradice Bagman 2 QR. Frameset – 2013 Surly Troll in Not So Dark Black size 18″ / M. 4130 Cro-Mo tubeset, massive tire clearance, braze-ons for about everything, affordable, and the rear dropouts are Rohloff hub compatible. Rear Hub – Rholoff SPEEDHUB 500/14 with axle bolts, chain tensioners and a 16 tooth cog. Tires depending on where I’m traveling, Schwalbe Marathon Mondial 26×2.15s or a Surly Knard front, Dirt Wizard rear combo, both with Slime Schrader valve inner tubes. I find the 45° sweep and the multiple hand positions of the Jones bar about perfect for long saddle days. For me, the 36×16 gearing for the Rohloff has 11th gear, which is 1:1, at a comfortable flat ground spinning cadence. One of my initial draws to the Rohloff is it’s compatibility with any 1/2 inch pitch chain, which makes it easy to find a cheep replacement. To further extend drivetrain life, both chainrings are stainless steel and reversible. I love the no cycling shorts needed comfort of the Brooks B17 and I’ve found keeping the saddle dry is the key to that comfort. Bags – Revelate Surly Pugsley frame bag, Harness with Sweet Roll, Storage Pocket, Gas Tank, and Jerrycan, and a Carradice Camper Longflap saddlebag in the rear. Bottles and Cages – Kleen Kanteen 27oz and 40oz bottles, King Cage Iris Cages, Topeak Modula cage on the underside of the down tube. Zefal 164 Magnums in King Cages and a Nalgene 48oz bottle under the downtube in a Blackburn Outpost Cargo Cage. Straps keep the bottles from rattling to much and cracking the cages. Powered by the Hub – Sinewave Cycles Revolution USB adapter and B&M Lumotec IQ Cyo front light, with the cables internally routed through the fork leg. That’s an awesome bike; I just hope the 26+ size is here to stay. So all these pictures are showing the Tubus rack and not the Carradice – since I imagine you cannot put panniers (type?) on the Carradice. I have a Nice rack on the back and thinking of one on the front and thinking of strapping drybags to them instead of the sweetroll and Viscacha I used on the Divide – damn the weight since the straps on both loosened miserably. I tend to pack more than I need and panniers are problematic off road. I have the same frame with full XT – wish I had your wheelset – sold my Fargo for the same reason (also 5’8″). Several friends have gone to flats but I ‘think’ that being clipped in is more efficient – but I should try flats on my next long ride. Enjoyed reading your stuff and look forward to your future posts! I started using the Carradice Bagman rack on the GDMBR, prior to that trip I used the Tubus rack and also carried more gear. Neither rack was/is the perfect solution for me. For my next trip I’m considering a rear rack with lower pannier mounts and using smaller front Ortlieb panniers and a dry bag on the back. This will give me a little more storage and allow me to fit my laptop. I prefer the Harness system for the front, especially for the weight savings over a rack and bag system, but I use a few extra straps to secure the load and keep it from swaying. On the pedals, I also feel being clipped in is more efficient, especially while climbing steep terrain and most all of my non-touring riding is clipped in. I prefer touring in regular shoes for their hiking versatility, even though I loose pedaling efficiency. Hopefully for people of our size the 27.5″ wheel size will catch in internationally.